A beach is a beach is a beach… for some, that is. 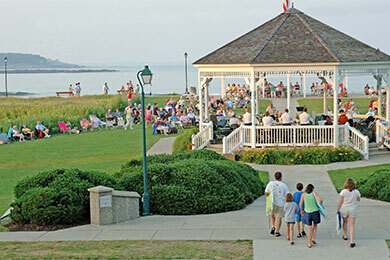 For families, it’s a combination of calm, clean water and sand, patrolled by lifeguards and complemented by nearby eats and attractions, such as boardwalks and playgrounds. The ideal beach is also located within short walking distance of accommodations; in fact, a recent Family Vacation Critic survey reveals 50 percent of families prioritize nearby hotels, rental homes and the like. Restrooms and showers add to the appeal, as well. 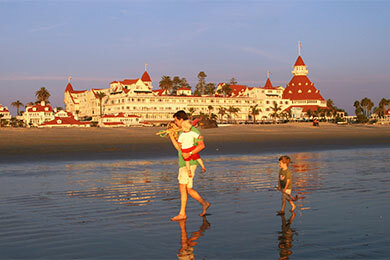 Coronado Municipal Beach – Coronado, Calif.
A SoCal staple, Coronado Municipal Beach returns to our annual list for many reasons, namely the soothing sand and surf that never feels crowded, even in the thick of summer. Plenty of lifeguards are stationed around the beach, as are hotels, which include the famous Hotel Del Coronado. “Hotel Del” is an attraction in itself, too, with organized historical tours (wait until you hear about the hotel’s haunted past) and several onsite eateries available to the public; Moo Time Creamery is a must for frozen treats, though picnic lunches are welcome on the beach, as are pets! You’ll also find restrooms at the hotel, and showers are stationed throughout the beach. Located just outside of San Diego, Coronado puts families close to the San Diego Zoo, Balboa Park and SeaWorld San Diego, too. Insider Tip for Families: There are tide pools located at the rocky sea break by the Hotel del Coronado, ideal for young swimmers. There are also fire pits located on the northernmost stretch of sand on Coronado Beach — perfect for S’mores. Ocean City Beach – Ocean City, N.J.
Sure, some Jersey Shore towns attract college crowds, but you won’t likely find them in Ocean City, which has a dry policy, forbidding the sale of alcohol. Instead, you’ll discover eight miles of relaxed oceanfront, complete with lifeguards, restrooms and showers, and enriched by a plethora of nearby activities. These include a boardwalk, where you’ll find Adventure Island Water Park & Mini Golf and Gillians Wonderland Pier, along with dozens of places to eat. Additionally, Ocean City offers plenty of budget-friendly accommodations near the beach, such as Seaport Inn Motel, where guests are given two complimentary beach tags. Insider Tip for Families: Ocean City has numerous free and low-cost events for families throughout July and August: Funtastic Tuesdays (every Tuesday), Beach Walks (every Tuesday and Wednesday), Family Nights (every Thursday), and Character Nights (every Sunday). 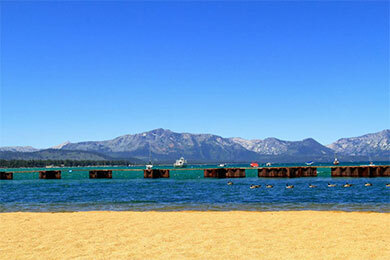 Zephyr Cove Resort – Zephyr Cove, Nev.
South Lake Tahoe touts high-rise casinos that might disappoint those who’ve sought a vacation off the grid. You’ll find unspoiled beauty at Zephyr Cove Resort, however, technically located in Nevada, but situated on the border of California. Monitored by a few lifeguards, shallow water provides amazing opportunities to swim, paddleboard (and stand-up paddleboard), or just float on a tube in the water, and a watersports rental service provides the necessary equipment to do so. Also right on the beach, Sunset Bar & Grille offers sandwiches, salads and other pub fare (though we highly recommend Rude Brother Bagels and Coffee, a short drive away). Zephyr Cove Resort offers hotel, cabin and campground accommodations, and a number of other inexpensive hotels and motels are located within walking distance of the beach. Insider Tip for Families: The M.S. Dixie is a 520-passenger paddlewheel sightseeing cruise that departs from Zephyr Cove daily, offering two-hour narrated tours. Lunch is available for purchase, and there are discounted rates for kids 11 years and under. 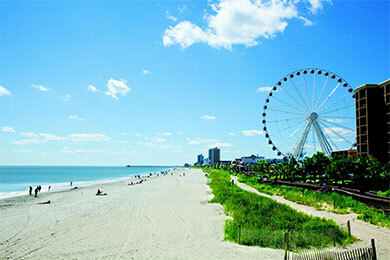 Myrtle Beach – Myrtle Beach, S.C.
Myrtle Beach might as well be a distant cousin of Disney World, with plenty of restaurants and an abundance of family-friendly attractions, such as MagiQuest Myrtle Beach, Medieval Times Dinner and Tournament, Family Kingdom Amusement Park, the Myrtle Beach Skywheel and the Hollywood Wax Museum Entertainment Center, slated to open this summer. Also new in 2014, several waterparks will offer outdoor fun – one of them, located at Crown Reef Resort, will even feature the world’s first hotel “explosion” slide! 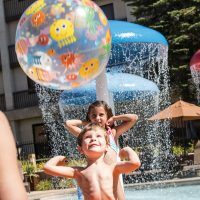 Many of the area’s oceanfront hotels, such as Sea Watch Resort and Ocean Reef Resort, already offer water playgrounds, too, along with extremely affordable rates. And when it comes to the beach itself, just stake out your spot and rest (literally) assured there are lifeguards, restrooms and showers nearby. Insider Tip for Families: The downtown boardwalk area of Myrtle Beach hosts free “Hot Summer Nights” events throughout the summer – including concerts, festivals and kids’ carnivals. There is a free fireworks display every Wednesday night at the 2nd Avenue Pier. When you think of Maine, you might envision Bar Harbor, Ogunquit and Kennebunkport. And while all of them offer lovely sand and surf, Short Sands Beach wins our vote. Small in size, it’s perfect for families with young children, who enjoy calm, clean water (you won’t likely see giant waves), lifeguards and restrooms, along with a playground and basketball court. Downtown York Beach is literally right next to Short Sands Beach, too, providing easy access to shops, restaurants, hotels, and attractions, which include York’s Wild Kingdom Zoo and Fun Park. Pack a picnic lunch and head to Nubble Light (Cape Neddick Lighthouse) while you’re in the area. Insider Tip for Families: York Trolley runs between Short Sands and Long Sands for an easy and inexpensive way to explore the area. The Shoreline Explorer’s Purple Line picks up from Short Sands to go to Ogunquit – tickets are a few dollars, and kids under 18 ride free. Crystal Beach – Destin, Fla.
At Crystal Beach, the sand is soft and white, the water is clear and turquoise and the atmosphere is completely calm, with little crowds to be found. Several lifeguards are stationed throughout, though the water is delightfully shallow for little ones — you can walk fairly far out in the water. Restrooms and parking add to the appeal, as do nearby attractions, restaurants and shops at Destin Commons. Plenty of other restaurants, such as Camille’s, afford oceanfront views, fresh fish and kid-friendly fare, too. Many families opt to rent a condo right on the beach while in town. 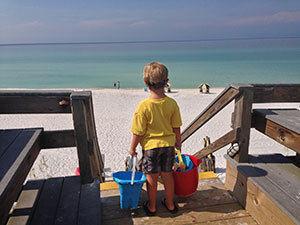 Insider Tip for Families: If you don’t want to lug all your gear to the beach, rent two chairs and an umbrella for around $25 per day — if you’re visiting for a few days, the rental service staff might give you a discount. Cannon Beach – Cannon Beach, Ore.
You might recognize this one from “Twilight” – it’s the same beach Bella visits with her friends, including Jacob, who tells her about mysterious Edward Cullen and his family. Even if you’re not a “Twihard,” you’ve probably heard of iconic Haystack Rock, which rises 235 feet at low tide, or the annual Sandcastle Contest, now in its 50th year. 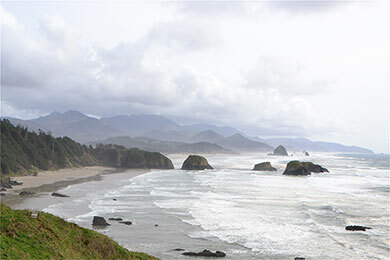 Other attractions include Ecola State Park, ideal for more beach walks, picnics and photo ops. Downtown Cannon Beach, while not a typical beachside town, offers several shops and restaurants; Driftwood and Lumberyard are among the most popular eateries for families. Plenty of oceanfront hotels offer accommodations for every price range. Among them is popular Surfsand Resort, which regularly offers rate discounts and a kids club, and is just steps from Haystack Rock. Insider Tip for Families: Pack binoculars and visit the beach at low tide, April through mid-May or late-June through July, to see the Tufted Puffins that frequent Haystack Rock. Mayo Beach – Wellfleet, Mass. 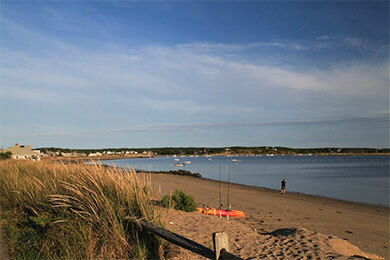 Mayo Beach is quintessential New England, with a peaceful place for families to relax. Close to the harbor, where you can rent a boat, shop and eat, you’ll see calm waves and commercial boats in the distance as you collect seashells from the sand. The water, which is protected by lifeguards, is surprisingly warm, too, but when little fingers start to shrivel up, a playground and tennis courts offer more fun across the street, and are accompanied by restrooms. Afterward, grab a bite to eat — and a book — at Wellfleet Bookstore & Restaurant, also located across the street. Many families opt to rent a cottage on or near Mayo Beach; a handful of Wellfleet hotels are located within short driving distance of the beach, and some families opt to stay in neighboring Orleans. Insider Tip for Families: During the summer, free Shakespeare plays are performed at the Wellfleet Rec Tent near Mayo Beach. Humiston Beach – Vero Beach, Fla.
Vero Beach, Fla. offers several beaches and parks, all of which are great for families, though our favorite is Humiston Park, since it offers a recently revamped playground, along with restrooms and showers. This stretch of sand, which is free to access, is also a nice place to enjoy a picnic lunch, with tables and grills readily available. Nino’s offers delicious pizza right by the beach, as well; after you grab a slice, head to Kilwin’s on Ocean Drive for chocolates and ice cream, followed by an evening stroll. Plenty of free parking is available, but oceanfront hotels, such as Holiday Inn Oceanside and Driftwood Resort, are a short and easy walk from the sand. Insider Tip for Families: Humiston Park hosts a Sunset Saturday Night Concert Series, with free entertainment every Saturday night. Local artists often display and sell their work on weekends, too. New Buffalo Public Beach – New Buffalo, Mich. If you don’t live in the Midwest, you likely haven’t visited (or even heard of) the beaches there. New Buffalo Public Beach, located on Lake Michigan and just over an hour from Chicago, is a standout, however. From the parking lot, a boardwalk allows easy access to the sand and water, which is strikingly shallow and clear – bring your snorkel gear! The waves have the capacity to be strong, but are consistently patrolled by lifeguards. The beach’s best asset, however, is the amount of amenities it offers, which include a nature trail, snack stand, playground, restrooms, showers, boat launch ramps and opportunities to fish in the Galien River Nature Preserve. More dining options, along with hotels, are a short walk (just across a bridge) into town. Insider Tip for Families: Get to the beach before 9 a.m. to avoid a parking fee (normally around $10), or after 8 p.m. to enjoy the sunset.